The third trimester of pregnancy is marked by various ceremonies in tribes of Indonesia. It may be derived from old animistic rites before the coming of “imported” religions in the archipelago, either Hindu, Buddha, Islam, or Christianity. These ceremonies usually symbolize gratitude for the pregnancy, celebrate the upcoming new member in the family, a momentum to wish good health for the mother and child, and smooth delivery of the baby. Why the third trimester? I am not sure but I guess because once the pregnancy reach the third trimester, the survival chance of the baby is higher. Perhaps it is also a chance to calm down and/or divert the nervousness of the pregnant women who are going to deliver really, really soon. After the so-called imported religions are spread in Indonesia, these rites do not cease to exist, but woven into the religious traditions. For example, in Java, the Muslims do special Quranic readings to commemorate the seventh month of pregnancy, while the Christians hold masses for similar purpose. There is a recent tendency for Muslims to do the Quranic readings in the fourth month of pregnancy instead, because the Al-Qur’an says that is the moment when God puts in the soul for the baby. Meanwhile in Java, that used to be the stronghold of Hindu, the remnants of Hindu traditions intermingle with animistic rites and religion rituals. In my dad’s Minangkabau tribe, the ceremony is conducted in the sixth month of pregnancy and called “membubur” (making porridge). The family of the pregnant mother will make porridge of rice, pumpkin, coconut sugar, and coconut; and deliver it to the extended family and neighbours. 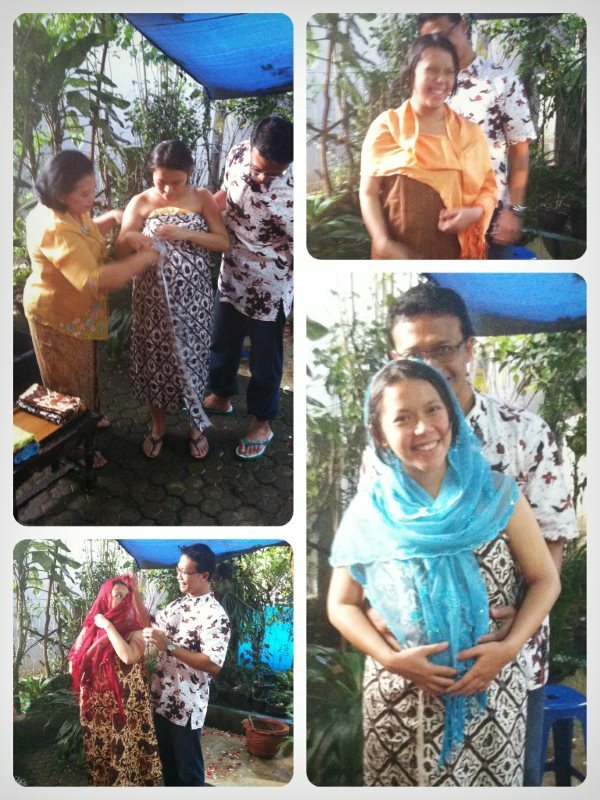 Meanwhile in my mom’s Sundanese tribe, it is called “nujuh bulanan” (the seventh month) and, as the name says, the ceremony is held on the seventh month of pregnancy. Nujuh bulanan is very similar with the Javanese “mitoni”, which will be explained in more details below. Anyway. 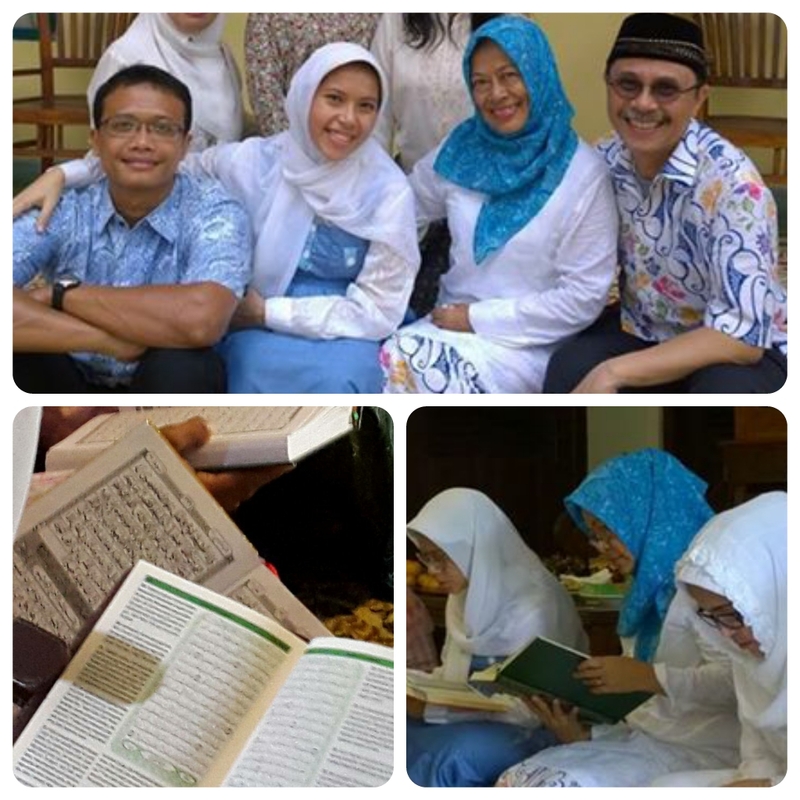 As my parents and I are not really into the hassles of doing traditional rites, we chose to do a Quranic reading. On the seventh month, not the fourth, for a practical reason: we had to do it in Yogyakarta, not Jakarta, and it’s way safer to fly in the seventh month of pregnancy than in the fourth. It was a simple ceremony attended by neighbours, family, and some of my parents’ friends. My dad opened the reading by thanking attendees, then me and mom read surah Luqman, a neighbour said a prayer for me and the baby (amened by the crowd), and then it was time to eat. A lot. Haha. Yoga’s parents and five close relatives and neighbours bathed me with water from seven springs that was infused with seven kinds of flowers. I raised a clay jug and slammed it to the floor — the spout was intact and this was interpreted to mean my baby will be a boy (remember, this is a tradition rooted in days of no USG scans). Yoga slides a chicken egg from my shoulder to my belly (it tickled) and let it fall to the floor. A yarn encircled my belly, then Yoga cut it, symbolizing that all obstacles faced by the family have been cut. Two ivory coconuts — one carved with Kamajaya (a Javanese rendering of Kamadeva from the original Hindu version) drawing and another with Kamaratih (Rati) — were pushed down through the last batik cloth I wore loosely (otherwise there would be no way for the coconuts to fall). Yoga slashed open the Kamajaya coconut. That night ended with a mass in Yoga’s parents’ house, serviced by the same father who interviewed us before marriage and who also gave the mass right before our marriage. But then my friends burst out of the bedroom and said, “Surprise!” 😀 I laughed happily and told them to wait — I had to change my clothes and dry myself first before hugging them one by one. It was really sweet. Apparently they conspire with Yoga to prepare the event, even creating a WhatsApp group for the sake of it. Btw, the baby voice came from Nila’s daughter, Lofa. 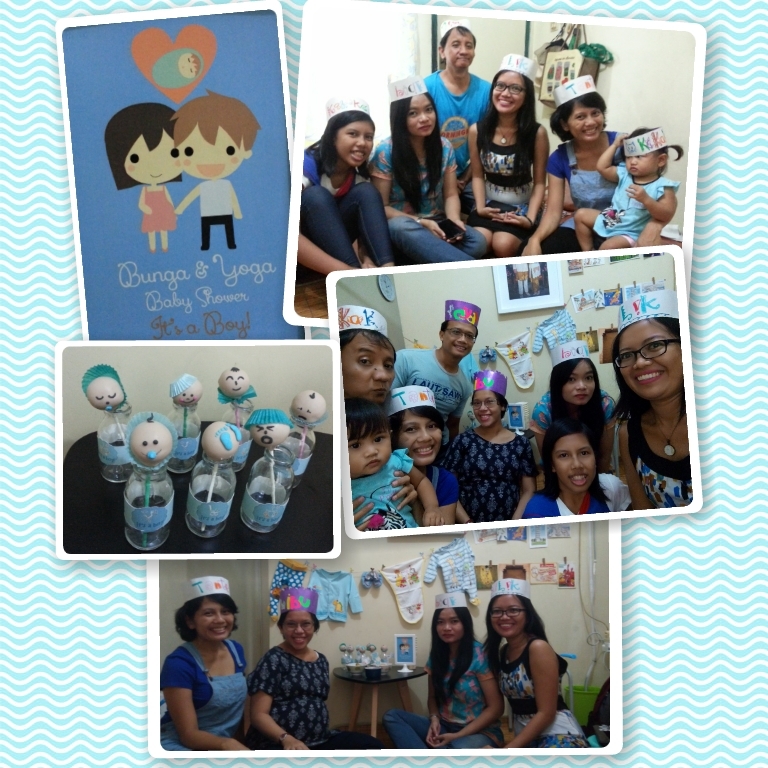 Nila brought her amazingly cute and delicious cake pops, We Pops, and traditional Bugis dish nasu liko chicken. Muno brought her yummy authentic Palembang pempek, Pempek Musi Duo. Fame of the cyapila.com cut lots of dragon fruits and pears. Yoga made Vietnamese spring rolls. I… well, I ate and laugh a lot. It was such a happy day, ended with playing monopoly until two of us went bankrupt — I won and it made me think that perhaps I’d make a good capitalist after all. Kidding. So. Just a few more weeks to go, baby! I can’t wait either! 😀 Aamiin, makasih ya Ira..